For a general overview of SCons usage for Godot, see Introduction to the buildsystem. A good rule of thumb for the -j (jobs) flag, is to have at least as many threads compiling Godot as you have cores in your CPU, if not one or two more. Feel free to add the -j option to any SCons command you see below. If all goes well, the resulting binary executable will be placed in the “bin” subdirectory. This executable file contains the whole engine and runs without any dependencies. Executing it will bring up the project manager. Using Clang appears to be a requirement for OpenBSD, otherwise fonts would not build. 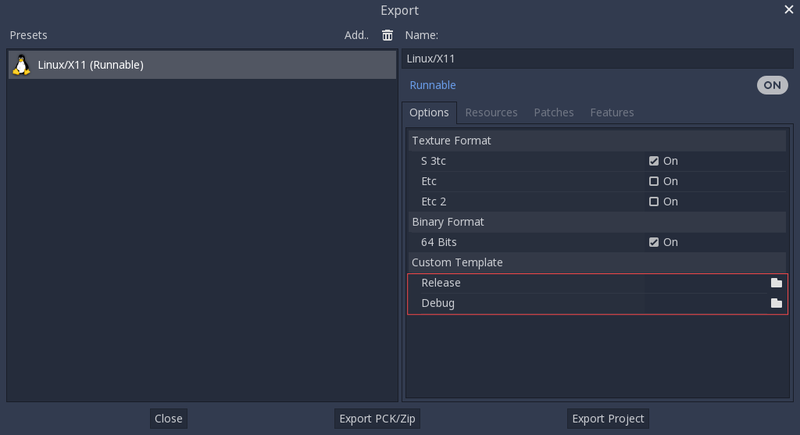 If you are compiling Godot for production use, then you can make the final executable smaller and faster by adding the SCons option target=release_debug. Note that cross compiling for the opposite bits (64/32) as your host platform is not always straight-forward and might need a chroot environment. You don’t even need to copy them, you can just reference the resulting files in the bin/ directory of your Godot source folder, so the next time you build you automatically have the custom templates referenced.